Welcome to the Tiger Launch Young Entrepreneur Spotlight! This is an interview series where we interview young entrepreneurs from across the country on why they do what the do and what has made them successful. 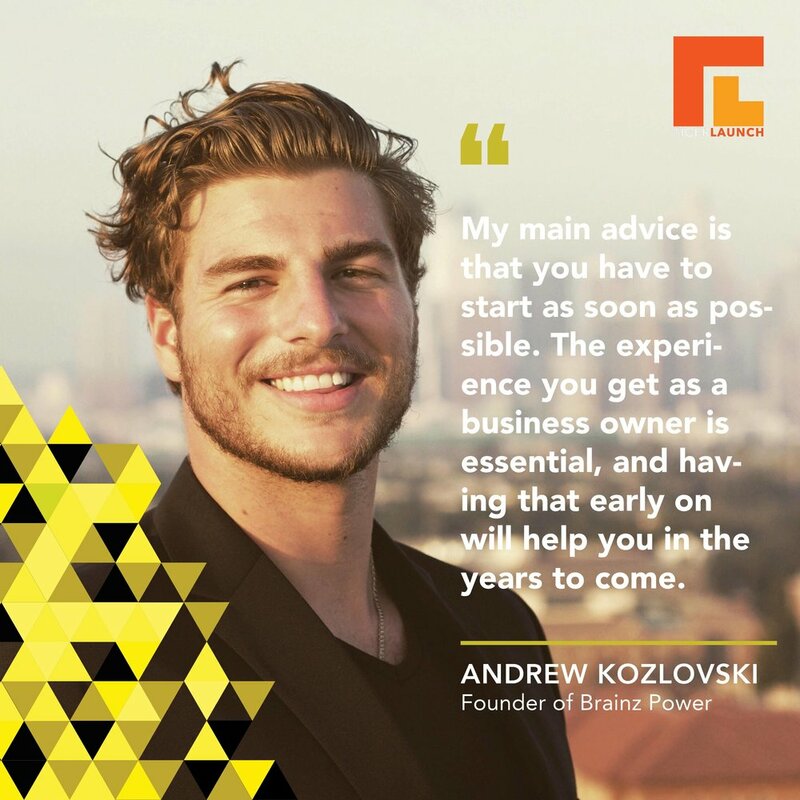 This week we spoke with Andrew Kozlovski who is currently a business major at the University of Southern California and the founder of BrainzPower. Enjoy and don’t forget to follow us on Instagram for future updates! Tell us a little bit more about yourself and what got you interested in entrepreneurship. I was born and raised in Atlanta, and my parents are immigrants from Russia. They owned small businesses, so I was around entrepreneurship the whole time growing up. My parents didn’t want me to be an entrepreneur, but I knew I wanted to be one when I got my first job. I begged for bigger roles and to be more involved with the company, but I wasn’t allowed to because I was so young. I knew that if I did life the way most people do it, I wouldn’t be able to do what I wanted to until 10 years from now. So I educated myself and spent hours listening to entrepreneurs and reading business books. How did you come up with your startup? I kept a notepad with business ideas and kept thinking of possible leads 24/7. I was a freshman, and I noticed that a lot of students talking about Adderall. No one that was using it had ADHD even though you need a prescription; they were just using it to focus in school. I was super conscious about everything because I was an athlete at the time, so I started looking for natural alternatives to Adderall. I could not find a single thing. What I ended up doing was researching ingredients that helped with energy and focus and started calling manufacturers until I found the right partner. It also helped that I was a college student and knew who needed the product because I was one. I catered the label to people my age through Instagram, and I’ve been running it for 3 years now. Tell us more about the process of becoming an entrepreneur. In the beginning, I wanted to do everything myself. The arrogance of having someone control your thoughts really drove me. This was probably the most valuable thing I could do because it enabled me to really know my company front and back. At the beginning, I was packing all the orders and doing all of the processing as well as running the company. I was soon packing 20 a day, so I eventually sought out some help. Now I have a team of about 10 people, which has been nice. What were some challenges that you encountered? What motivated you to continue even when things didn’t turn out the way you wanted them to? My biggest struggle has been finding the balance between school and running my company. It’s been hard because I want to transition from social media marketing to more mass distribution across the U.S as the next step of my company, but to do that, you have to pitch the product and meet with investors, which is incredibly time-consuming. I don’t have the luxury to do that when I’m in school, but after I graduate I’ll be able to fully devote myself to my company and help it live up to its full potential. What has been your greatest accomplishment regarding your startup? Honestly, just starting, because that’s the hardest part. It’s so hard to come up with that great idea and commit to it. The best investment was within the two months of the business. I ran an Instagram advertisement within 6-8 weeks of making the product. I made $1000 dollars and that’s when it hit me that my company was actually real. It was super cool. Also, making six figures in the first term of business. We have this idea in Georgia that making six figures means you’ve made it. I wrote a check for that amount and carried it around with me. And when it finally happened, it was amazing and I felt so proud. How did you garner such a large social media presence, and do you think it has significantly helped you further your career? In the beginning before I had the product in my hands, I had a few months of runtime. I’d study the people who are already big and analyse it myself. On social media there’s a trail for everything: geotags, hashtags, times, etc., and you can see what is the most successful. I implemented my marketing strategy and did trial and error. I would post certain types of pictures and analyzed which got the most likes or feedback. Social Media has been responsible for all the sales for Brainzpower, so it’s definitely a huge part of my success. What is the value that you see in entrepreneurial competitions like TigerLaunch? I think any competition that helps you with your pitches/speech and help you perfect your business skills is incredibly valuable. How do you balance the duties of being a college student and owning a company? You basically get away with whatever you can do in school and focus your all on the business. The material they teach you in class is so easy to access, and you’re not learning anything that helpful for business. Most success, in my opinion, is self taught or learned by experience. I still say that you should do well in school because it’s a good framework, but what separates you is what you do outside of it. Do you think that being a business major has helped you start a successful company? Although the curriculum hasn’t helped me that much in founding this company, the people you meet make it worthwhile. The alumni and other connections you create in college were so helpful to me. Do you have any advice for future, young entrepreneurs? My main advice is that you have to start as soon as possible. The experience you get as business owner is essential, and having that early on will help you in the years to come.